This week I took all my boys to see the movie Dunkirk. I think you have to see way more movies than I do in order to be a movie blogger, but this movie inspired me. It’s a movie written by men, for men. There is no character development and little to no relational details. Through the entire film I just kept wondering what everyone’s names were, what their background stories were, and who was waiting for them at home. The constant action and fighting completely stressed out my war-traumatized husband. It is honestly not a movie that I’d recommend to my girlfriends and I probably won’t watch it again. But… there is an exchange near the end that brought me to tears. Far too often we humans have a habit of expecting more of ourselves and our fellow human beings, than simply surviving. And often, survival is our greatest accomplishment. I do believe with all that I am that we were created to THRIVE. But I don’t know a single person that escapes this life without seasons (some short and some very long) of struggle. We all spend seasons in the fire. James 1:2-4 …when troubles of any kind come your way, consider it an opportunity for great joy. For you know that when your faith is tested, your endurance has a chance to grow. So let it grow, for when your endurance is fully developed, you will be perfect and complete, needing nothing. Notice it says, “when” and not “if”. Troubles in this life are a guarantee. Notice also that it says, “… your endurance has a chance to grow.” Do you know what endurance means? One short interaction between an old man and a young soldier in Dunkirk broke me. During the years that our family sat in a furnace I beat myself up for how little I accomplished. Getting out of bed, breathing, caring for my family; took every single ounce of my energy and endurance. Relationships fell by the wayside. Career, education, and ministry goals were shelved. Anything other than keeping our family together and alive, fell to the very bottom of my priority list. My singular focus was on survival. As we’ve walked out of the furnace into a season of thriving, I’ve continued to struggle with how little I accomplished in those four years. I’ve always set the bar high for myself and given myself little grace when I don’t reach that bar. My guess is that many of you fight that same battle. Here’s the thing, God did create us to thrive and there is no thriving without grace. Let’s give ourselves some grace. I invite you to embrace a bit of freedom with me. If you’ve survived your hardest days, well done. Growing up in south Louisiana is a privilege. I’ve been around the world and I’ve experienced no culture, food, or people, quite like those of my home. In south Louisiana Mardi Gras is a season. 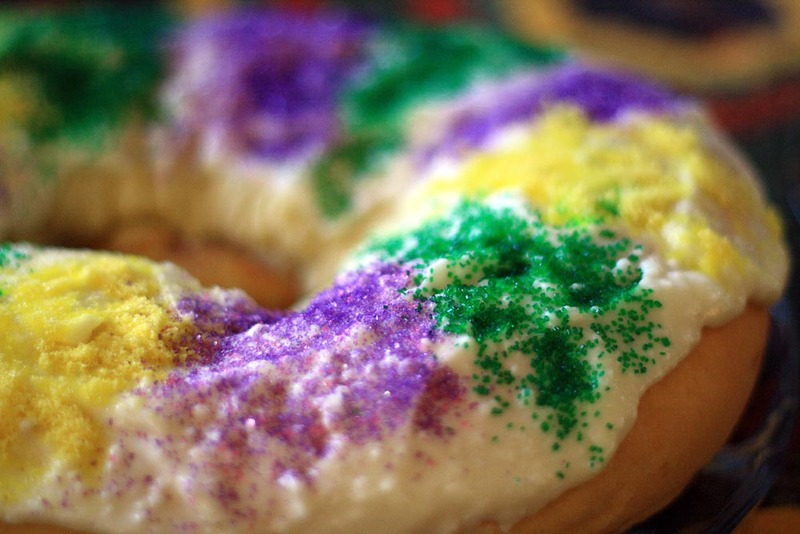 Much like Black Friday and tree sales initiating the Christmas season, I grew up with king cakes, parades, and Mardi Gras balls initiating the Lenten season. As a little girl I wanted so badly to be Catholic. I was just about the only kid in elementary school who didn’t ‘get to’ go to catechism. We were (still are) non-denominational Christians and listening to the other kids plan out and talk about their catechism carpools and the mean nuns left me feeling like a red-headed step-child (no offense to my ginger friends). I wanted my own rosary and I wanted to see my friends get hit on the back of their hands with a ruler by a nun when they talked during prayer. I eventually got over the desire to be Catholic and decided to just embrace the parts of Catholicism that I found enjoyable and comforting. Even so, not living in Louisiana for more than twenty years means that I’ve missed out on being immersed in the season. For many years I whined about missing the parades and having to make my own kingcakes. And then, a few years ago, I realized that I was not only missing all the fun aspects of the Mardi Gras season. I was missing the reverent aspects of the Lenten season as well. Although I had been one of the few non-Catholic kids in school, just living in Baton Rouge meant that I didn’t have meat in the cafeteria on Fridays and that I didn’t have school at all the week of Mardi Gras and Ash Wednesday. And, even though my Mom would explain to me every year from the time I was six that I “didn’t have to”, I still gave up something every year for Lent. I had to have something to add to the playground conversations and to be honest, I liked the discipline of the giving up. I still do. I fast from various things at various times throughout the year and I am always blown away at the really BIG WAYS that God shows up when I’m giving something up and replacing that something with Him. A few years ago, during the Lenten season, something amazing happened. While I was in Lake Charles, Louisiana caring for my grandmother, my dear hubby was home in Virginia studying all things Ressurectionish. I returned home to find a mezuzah attached to the frame of our front door and a book laying on the kitchen counter telling how to prepare the Passover Seder. My former Catholic, very Italian husband, got in touch with his Jewish roots. He found a desire to honor the beauty of Christ’ life, death, and resurrection in physical, tangible ways. As dear hubby and I gave homage to all things Christ-centered, we talked to our children about the Lenten season and the crucifixion and the resurrection. We reminded them over and over that all of it was for grace. That Christ did not just come to earth and live as a man and die FOR us, but AS us. We told them that he felt pain and misery and abuse so that we could let go of those things when they happen to us. We told them that he was tortured and beaten for every wrong thing that any of us would ever do. We told them that he conquered death so that all of those wrongs would not have the power to dictate how we live our lives. We told them that he died for our freedom. He died for our redemption. He died because he loves us. He died for grace. We’ve told our children these things throughout their lives, but grace and love and freedom are so much bigger than what can be told. They must be shown. Yes, my children know what this season is about. But the same year that my husband found his Jewish roots, I found myself burdened. I want my kids to experience Christ, not just know about him. I desire more than anything for grace and freedom to be part of their identities, not just part of their knowledge base. I knew all about Jesus when I was a teenager, but I was clueless when it came to grace and freedom and unconditional love. Unfortunately, my lack of understanding led me to believe that choices I made could never be forgiven. My lack of experience with the realness of Christ’ sacrifice led to years of running and self-destruction. I want more for my children. God, let them know! Let them know how BIG your love is. Let them know how BIG your grace is. Let them walk in freedom every day of their lives. Give them total understanding that NOTHING can separate them from your love. Give me wisdom in showing them these things. Amen. When I was giving up something for Lent as a child I appreciate that my Mom made it clear that I had free will and that I did not have to. But I really wish she had taken the time to teach me what Lent was about. I wish I had known that the “giving up” was in honor of what Christ gave up for us. I really wish that I had had some tangible symbolic activity that I could connect to scripture as a reminder that freedom and love and grace are mine for the taking. But I didn’t. And now… I have a chance to redeem my story. I have four (not-so) little people in my care that I CAN provide with a tangible symbolic activity that can be tied to scripture. In my endeavor to find that activity, I came across this blogpost by Ann Voskamp. Read it. Be inspired. On New Year’s Eve 2012, we had a little party at our house. Instead of having people sit around and discuss or write down their hopes, dreams, aspirations, and resolutions for 2013, I gave everyone a couple of index cards and a pen at 11:30pm. I asked everyone to go find a quiet spot and write down ALL of the things that they would like to leave behind in 2012. And then… just before midnight, we put our cards, one-by one, in the fireplace and watched them burn. 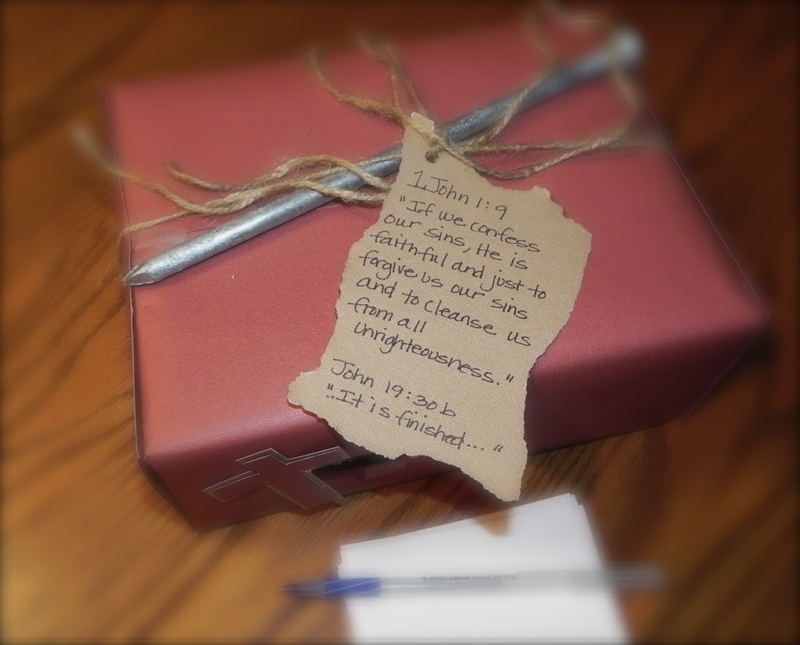 For the last few years, as an attempt to SHOW what Holy Week is all about, I build a repentance box. Our family (and friends who stop by during the week) write out our bad choices, our pains, every ounce of unforgiveness. All the junk Christ carried to the grave, we place it in the box and let it go. And just before midnight, on the Saturday before Resurrection Sunday, we will turn it all to ash. On the day before that flight home, the Belgrade hotel room that I shared with my dear friends Lisa and Rachelle became a prayer closet. People came by throughout the afternoon and evening to pray with us. Some drove hours just to share space with someone who shared their God. The last person to stop by was a woman named Mila. Other than the fact that she had been at a prayer conference in Sarajevo the month before, I knew nothing about her before she came to our door. As she got comfortable on our little hotel couch and explained to the women in the room that God had spoken to her at that conference in Sarajevo about opening a crisis pregnancy center, I created a confidently smug reply in my head. With the two women who know me (just about as good as I know myself) sitting nearby, I looked Mila in the eyes and said, “I’m not called to work with a crisis pregnancy center. You see. I had two abortions before I was married and I hope that God is more merciful than to call a person to minister in the one area that hurts the most.” Lisa and Rachelle actually laughed out loud. In the two weeks after my return from Serbia, I prayed over the list I created on my journey home. I knew that I had no power to meet all of the needs on that list, but that I was called to meet at least one of them. Over the course of those two weeks, God allowed me to have three very significant conversations (one of them with my own daughter) that led to a clear revelation about my calling. In the seven months since that clear revelation I have denied that calling. Today, God showed me that it’s time to come clean. I killed my babies. I have written an entire book about healing and I’ve led people to believe that it’s all about being healed from cancer. It is not about cancer. It is all about the process of being healed from the wounds that led to cancer. You will have to buy the book if you want to know my whole story. My whole story is not what this blog-post is about. This post is about my disgust with the body of Christ over their approach to abortion. My point today is that the men waving their Bibles in the air and the young girls who called me a baby killer were very far removed from the God I have come to know personally. The God who loves me DESPITE my shortcomings. The God who taught me that His grace is bigger than any wound I have ever received….. Whether the wound was inflicted by others or self-inflicted. For more than a decade of my life I tried to earn grace. I tried to atone for killing my babies. I thought that by refusing to enjoy the amazing life I had, I could somehow make the pain and guilt go away. My plan did not work. In the fall of 2002 I sat at Cascade Hills Church in Columbus, Georgia and listened to Dr. Bill Purvis preach a sermon on grace. I grew up in church, attended a Christian school throughout middle school and part of high school. Yet, somehow I missed out on the one thing God is really all about. 2 Corinthians 12:9 Each time he said, “My grace is all you need. My power works best in weakness.” So now I am glad to boast about my weaknesses, so that the power of Christ can work through me. Much like the moment today when I realized I was going to write this post, I was broken. God is ALL ABOUT GRACE! All the years I spent trying to punish myself were years wasted in an attempt to be my own god. Vengeance and justice are not mine. They belong to God. If you don’t believe me, do a Google search on “scripture God vengeance”. He is pretty stinking clear on the subject. Those girls at the second clinic, the men with the Bibles at the first clinic, and me, myself and the thirteen year old I, are all just a part of the failure of The Church. As Christians, we have spent our resources (man-power, money, time, and energy) fighting abortion by telling girls and women that abortion kills babies. In that attempt we have not stopped abortion nor gained political ground. We have simply made the wounds of the women who’ve experienced abortion that much bigger. I think we’ve all got it. Abortion kills. If you believe that life begins at conception, then you cannot argue the point that choosing abortion means choosing to end a life. Where is the love in screaming out, “Baby Killer!” to a girl who does not see any other option? Where is the love in a church who shows slide-shows of aborted fetuses? What kind of love does that show to the women (or men) who have lost a child to abortion? If you have not walked in my shoes, you can not judge me (Read Matthew 6). Am I guilty of murdering my babies? Yes. Has the healing process been hell? Yes. Has the body of Christ made that healing process a thousand times more painful? YES! Is murder unforgivable? No. the apostle Paul was very clearly a murderer and thirteen books written by him still managed to make it into the New Testament of the Bible. God is ALL ABOUT GRACE!! He is ALL ABOUT HEALING!! He is ALL ABOUT LOVE!! Personally, I do not think we will ever see an end to abortion. If the devil can get mothers to kill their babies before they are ever born then he doesn’t have to work to kill them throughout their lives…. John 10:10 “The thief’s purpose is to steal and kill and destroy….” Abortion kills a baby and destroys the life of a mother. The other half of John 10:10 says, “….I came that they may have life and have it abundantly.” The “I” in that verse is Christ. Body of Christ, I challenge you to make a choice. You can either be a part of the “destroying of lives” or you can be a part of the “life abundant”. Do not call yourself “pro-life” unless you are actually pro-life. You see…. Until The Church actually decides to show love and grace to women who have experienced abortion, there will never be any women to minister to those who are considering it. I cannot tell you the number of CHRISTIAN women I have met that bow their head in shame and whisper, “me too.” when they hear my story. Church, we have failed. You wanna be like Christ? The next time you meet a girl who’s pregnant and uncertain about what she will do, tell her that no matter what she chooses, GOD STILL LOVES HER! Tell her that “HIS GRACE IS ALL SHE NEEDS!” Talk to her about adoption. The next time you hear another Christian talking about their stand on abortion, ask them what they are doing to encourage and support adoption. After all, we were not instructed that pure ministry was to stop murder in James 1:27. We were instructed that pure and undefiled ministry, before God, is to take care of the fatherless. If you want to be pro-life, you must first be pro-choice. CHOOSE to encourage the abundant life promised by God to both unborn babies AND to the women who have lost their babies to abortion. CHOOSE to not be a part of the enemy’s scheme to steal (joy, peace, love, grace, you name it), kill (babies whose Moms feel rejected and/or judged by the body of Christ and who do not see any other options being promoted by the body of Christ), and destroy (the lives of babies, women, men, grandparents, aunts, uncles and anyone else who cares). After explaining to Mila on that day last May how I was not called to work with her, I explained to her all the things I have just described for you. I told her that the only way she would ever make a difference (in a nation that averages three abortions to every one live birth) would be to offer grace, love, and healing to women (and men) who have experienced the loss of a child through abortion. Mila listened to me. Her center will be a place of healing. After seven long months and a roller-coaster ride of chasing after worthy callings that are not my own, one thing is clear. God is immeasurably merciful mixed with a twisted sense of humor in the needs he calls us to fill. He gives us love and grace to the point that we can overflow that love and grace to others. This is my gauntlet. Consider it thrown.